The electric solar wind sail, or electric sail for short, is a propulsion invention made in 2006 at the Kumpula Space Centre. See also the list of Frequency Asked Questions. A full-scale electric sail consists of a number (50-100) of long (e.g., 20 km), thin (e.g., 20 microns) conducting tethers (wires). The spacecraft contains a solar-powered electron gun (typical power a few hundred watts) which is used to keep the spacecraft and the wires in a high (up to 20 kV) positive potential. The electric field of the wires extends a few tens of metres into the surrounding solar wind plasma. Therefore the solar wind ions "see" the wires as rather thick, about 50 m wide obstacles. A technical concept exists for deploying (opening) the wires in a relatively simple way and guiding or "flying" the resulting spacecraft electrically. The implementation details are presently under study. The solar wind dynamic pressure varies but is on average about 2 nPa at Earth distance from the Sun. This is about 5000 times weaker than the solar radiation pressure. Due to the very large effective area and very low weight per unit length of a thin metal wire, the electric sail is still efficient, however. A 20-km long electric sail wire weighs only a few hundred grams and fits in a small reel, but when opened in space and connected to the spacecraft's electron gun, it can produce a one square kilometre effective solar wind sail area which is capable of extracting 1-2 millinewton force from the solar wind. For example, by equipping a small, 200 kg, spacecraft with 100 such wires, one may produce acceleration of about 1 mm/s^2. After acting for one year, this acceleration would produce a significant final speed of 30 km/s. Small payloads could be moved quite fast in space using the electric sail, a Pluto flyby could occur in less than five years, for example. Alternatively, one might choose to move medium size payloads at ordinary 5-10 km/s speed, but with lowered propulsion costs because the mass that has to launched from Earth is small in the electric sail. One limitation of the electric sail is that since it uses the solar wind, it cannot produce much thrust inside a magnetosphere where there is no solar wind. Although the direction of the thrust is basically away from the Sun, the direction can be varied within some limits by inclining the sail. Tacking towards the Sun is therefore also possible. 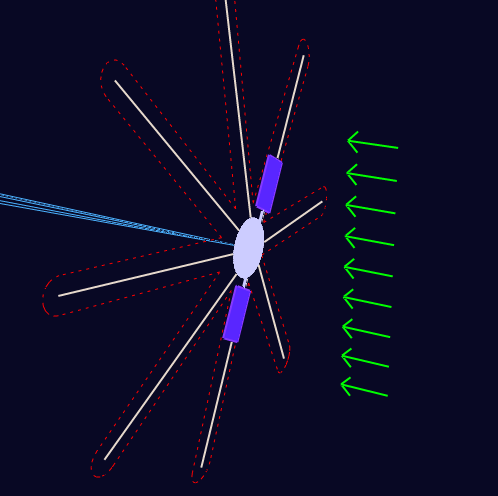 A schematic view of the deployment phase of a spinning electric sail. Only eight wires have been drawn for simplicity. 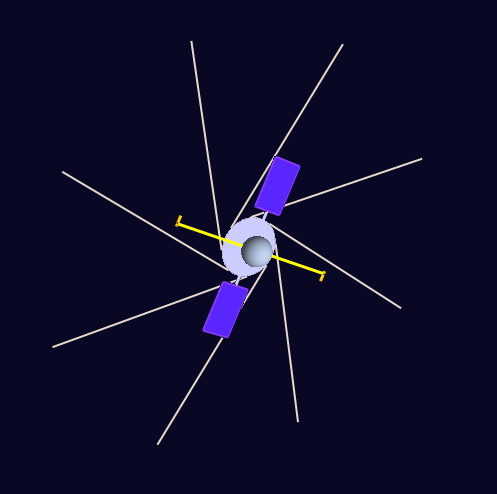 The violet-blue surfaces are solar panels and the yellow lines are propulsive arms (with small rockets attached to the tips) which create the initial spacecraft spin. In this phase the wires have been deployed and the electron gun has been started. The blue lines symbolise the electron beam of the gun. The spinup propulsion arms and associated fuel tank have been jettisoned to save mass. The solar wind acts on the wires, bending them slightly. The electric field around the wires is depicted by dashed red line. These figures are part of an 17.8 MB animation.